MDC Alliance leader Nelson Chamisa (file photo). 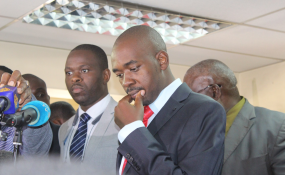 MDC Alliance leader Nelson Chamisa yesterday filed his election petition at the Constitutional Court challenging President Mnangagwa's victory in the July 30 harmonised elections. In the petition -- filed shortly before the expiry of the seven-day period -- Mr Chamisa alleged electoral fraud and malpractices during the elections in which Zanu-PF romped to victory, claiming two-thirds parliamentary majority with President Mnangagwa taking a 6.5 percent lead. After the Zimbabwe Electoral Commission (ZEC) announced the results, Chamisa called a Press conference and described the election results as fabricated and overblown to ensure the incumbent President's victory. His lawyer Advocate Thabani Mpofu said they had overwhelming evidence to prove that Mr Chamisa was cheated. The court has 14 days within which to make a determination of the dispute after all the parties completed filing the necessary papers. According to his draft order, Mr Chamisa is seeking the nullification of President Mnangagwa's victory and wants the court to declare him the winner. He claimed the election was not conducted in accordance with the law and was not "free and fair". "The election results announced by the Commissioners of the Zimbabwe Electoral Commission on 2 August 2018 and the concomitant declaration of that same date by its chairperson to the effect that Emmerson Dambudzo Mnangagwa was to be regarded as the duly elected President of the Republic of Zimbabwe with effect from the 2nd of August 2018 is in terms of section 93(4)(b) of the Constitution of Zimbabwe as read together with section 111(2)(b) of the Electoral Act(Chapter 2:13) declared unlawful, of no force or effect and accordingly set aside," read part of the order sought. ZEC declared President Mnangagwa duly elected with effect from August 3, 2018. The Constitution requires a losing presidential candidate to file a challenge within seven days of a winner being declared. "The applicant, Nelson Chamisa is in terms of section 93(4) of the Constitution of Zimbabwe declared the winner of the presidential election held on 30th July 2018." Consequently, Chamisa wants the chief elections officer compelled to publish in the Government Gazette the order and the declaration of the election of Mr Chamisa to the office of the President of Zimbabwe. After filing the petition, Adv Mpofu told journalists that in terms of the basis of the evidence they placed before the court, what they are seeking in the main relief "to the effect that the court should declare the proper winner and the proper winner is my client". "In the alternative, we seek that there be another election which complies with the dictates of the law," he said. Adv Mpofu told the local and foreign reporters that there were so many things they had alleged in the petition. "We have managed to place before the court unpopulated signed V11 forms and V11 forms that shows an attempt to erase the figures that had been entered," he said. "We have managed to place before the court all the mathematical and statistical irregularities." In his regard, Adv Mpofu said there will be no inauguration of President Mnangagwa until the determination of the electoral dispute by the highest court in the land. Mr Chamisa disputed the results alleging the elections were engineered to rob him victory. President Mnangagwa along with the other 21 losing presidential candidates and ZEC -all cited as respondents in the high-profile petition have three days to respond. After filing their responses, Mr Chamisa's lawyers have also three days within which to file their answering affidavits in the matter to set the case rolling. Zanu-PF has since put together a 12-member legal team to prepare responses to litigation by Mr Chamisa, who has been threatening multi-thronged action ever since he lost, including litigation. Last week Zanu-PF Secretary for Finance Mr Patrick Chinamasa confirmed the setting up of the 12-member legal team, saying the MDC Alliance's threat of litigation was unwarranted. The legal team include Zanu-PF Secretary for Legal Affairs, Paul Mangwana, a veteran lawyer.